What is also made clear by the Wheelock production is that any Boston actor who wants to take a crack at playing Usnavi, a bodega proprietor who is the chief protagonist of “In the Heights,’’ is going to have to somehow get past Diego Klock-Perez first, because he is claiming virtual ownership of the role, at least locally. The very last word of this musical’s stirring finale is “home,’’ and seldom has that deceptively simple word been more richly explored. Depending on who is speaking or singing, home is a place to escape or a place to return to, a springboard or a sanctuary. In this case, home includes the neighborhood where the mostly Latino characters of “In the Heights’’ live, work, love, clash, and strive: Manhattan’s Washington Heights. As they nurse their own private dreams and wounds while coping with major events — a blackout, a winning $96,000 lottery ticket, the sudden sale of a business that has been a longtime neighborhood fixture — “Heights’’ strikes a tone that is exuberant and wistful by turns. 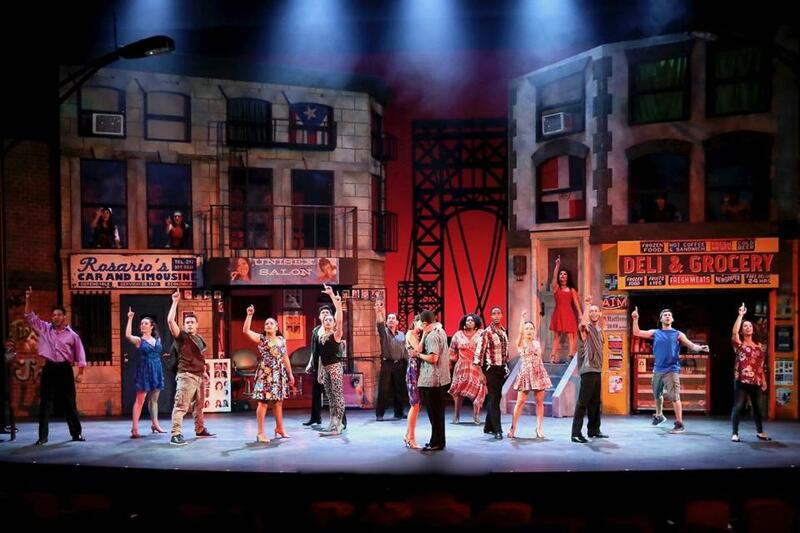 Change is in the air from the dynamic opening number, the title song “In the Heights,’’ performed by Klock-Perez and the rest of the company. (The hard-driving orchestra is led by music director Dan Rodriguez.) As with “Alexander Hamilton,’’ the opening number in “Hamilton,’’ the song “In the Heights’’ skillfully sketches an overview of theme, character, and milieu. In one way or another, all of the main characters — not just Usnavi — are grappling with a choice between aspiration and security. Meanwhile, Nina (Laura Lebron Rojas, excellent), whose academic prowess has long been a source of neighborhood pride, has dropped out of Stanford, burdened by the need to work two jobs at school. She has come back home shame-faced and uncertain — a state of mind beautifully captured by Rojas. Carrying a torch for Nina is Benny (Darren Bunch), a dispatcher at the cab company owned by Nina’s parents, Kevin (Luis Negron) and Camila (Rosi Amador). Inspired by Nina’s quandary, Kevin makes a rash decision that ignites discord in his marriage. Miranda’s verbal invention goes hand-in-hand with an occasional tendency toward facile rhyme, and his big-hearted empathy tips over into sentimentality in the depiction of Abuela Claudia, a kind of surrogate mother to Usnavi. Played at Wheelock by Johanna Carlisle Zepeda, Claudia doesn’t evolve into much more than a cloying cardboard saint. But the musical’s strengths far outnumber its weaknesses. From the start, Miranda knew what he was doing. “In the Heights’’ still sizzles with in-the-moment urgency. Miranda did not throw away his shot.